I am constantly searching for rare or unpublished memoirs of soldiers who served during the Napoleonic Wars to bring to a modern audience and this is one that I have recently re-discovered. Paymaster John Harley wrote his memoirs in the late 1830’s, some fifteen years after he had left the army under somewhat questionable circumstances – we will come back to this issue later. He apparently published this memoir privately in two volumes in 1838 a few years before his death – quite possibly because Harley hadn’t found a mainstream publisher because of its potentially libellous content – only four hundred copies were apparently ever printed . For this reason alone, it would be rare, but searches of worldwide bibliographies reveal no known copies anywhere, apart from the one copy that I have discovered in the British Library, making it very rare indeed and I am very glad to be able to rescue it from such obscurity. John Harley was according to his own account, born in Cork, Ireland on 18 November 1769 but his father then died within a few weeks of his birth, he therefore lived with his mother for most of his youth in the area of Kilkenny. At the age of fourteen he was put to work at a merchant house in Cork but he never really settled in this role and when offered the opportunity of obtaining a lieutenancy in the military if he could procure fifteen volunteers, he jumped at the chance. He achieved this, just, and was duly appointed as a lieutenant in the Irish Tarbert Fencibles on its formation in 1798. Fencible regiments were raised at time of threat of invasion, to bolster the defences, freeing up regular, better trained troops for other operations. They had first been raised in 1759, and had then been raised again during the War of American Independence and now during the Irish Rebellion of 1798 when there was the very real threat of a French invasion. The fencibles were viewed as militia, but officered by regulars, hence the value put on his new appointment by John. The Tarbert Fencibles soon sailed from Ireland, staying at a number of garrisons in South Wales, Gloucester, Poole and then Southampton, having experienced a number of adventures along the way. At this period, Harley gained a commission as Quartermaster of the 54th (West Norfolk) Regiment of Foot on 12 June 1800 and joined his new regiment at Winchester. Soon after they were ordered to proceed abroad and within a year Harley found himself trudging through the hot sands of Egypt in the campaign of Sir Ralph Abercromby to oust Napoleon’s French army from North Africa. Following the campaign, they formed part of the garrison of Gibraltar and were there during the infamous mutiny against the governor the Duke of Kent. Soon after, with the signing of the Peace of Amiens, bringing the war between Britain and France to a temporary end and in the government’s clamour to reduce the size of the armed forces John Harley was placed on Half Pay on 24 June 1802. Harley soon found a new position however, becoming Quartermaster to the 60th (Royal American) Foot on 12 February 1803, but it seems that this appointment had hardly been announced when he exchanged again to become Quartermaster of the 27th (Inniskilling) Foot on 2 April and then exchanged again as Quartermaster in the 1st Battalion 47th Foot by exchange on 2 June 1803. It is therefore very unlikely that he ever physically joined either the 60th or the 27th. The 47th (Lancashire) Regiment of Foot had recently returned from a ten-year stint garrisoning the islands of New Providence and the Bahamas. A second battalion was now raised as well in 1803. The two battalions of the regiment remained together at Colchester when John joined them and they continued to move together to garrison Woodbridge and then Liverpool, before they embarked for Dublin in January 1804, the 1st Battalion marching to Kilkenny and the 2nd Battalion to Clonmel. On 11 July 1805 John Harley gained the position of Paymaster to the 2nd Battalion and moved with it around Ireland for the next three years, staying for short periods at Cork, Cahir, Belfast, Enniskillen and finally Omagh in March 1807. The 1st Battalion sailed from Cork in May 1806 for the East Indies, but was diverted at the Cape of Good Hope to participate in the attack on Montevideo in 1807, but after this disaster, they did continue on to India, where they served for the next twenty-one years. John Harley’s battalion proceeded to Preston in May 1807 and to Chelmsford in the autumn, where they remained until 1809 when they were finally ordered for foreign service. They sailed for Gibraltar in October 1809 and were then transferred to Cadiz, which was under siege and they also became involved in the defence of Tarifa in 1811. The following year the siege of Cadiz ended, the battalion marched to Seville and then joined in the difficult retreat to Portugal at the end of the 1812 campaign. The following year the battalion was at the Battle of Vitoria, where John received the awful news of the death of his son, who was serving in the same regiment as a lieutenant; he then took part in the siege of San Sebastian. In 1814 the regiment was engaged in the crossing of the Bidassoa, the battles of the Nivelle and the Nive and finally involved in the sortie from Bayonne, when the war ended. The 2nd Battalion was not involved in the war in America or at Waterloo and was disbanded at Liverpool on 24 October 1814 and those effective men and officers were sent to India to join the 1st Battalion there. John Harley went on half pay in 1814 and he continued on half pay until he resigned his commission for a commuted allowance on 20 January 1832. He then lived in Liverpool until his death around 1843 (there is a death recorded at Liverpool that year but there are not enough details to prove it is our man). John Harley had by his own statement married and had children, but all searches have proven fruitless in finding records of any wedding or births. Memoirs of soldiers serving in the 47th (Lancashire) Regiment of Foot are very rare, despite their extended period serving in the peninsula, only one other having surfaced to date and that also published by the current editor in 2012. 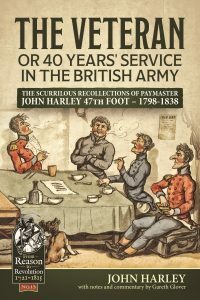 This alone would make John Harley’s memoirs important, but they are also essential reading for anyone wishing to gain a real insight into life in the British Army in the Napoleonic Wars – for they are like no other. As a Paymaster, Harley was rarely in the fighting, but he was certainly close to the action at times and also saw much of the terrible aftermath. However, some of the greatest and most entertaining memoirs have already come from non-combatants, including the bawdy tales of Commissary August Schaumann, Surgeon Henry’s trifles, and the stories of Commissary John Daniel, Surgeon Charles Boutflower, Paymaster John Dayes, Robert Cooke of the Pay Corps and the Reverend George Stonestreet. It is a simple truth that if you want to know what it was really like serving in the British army for the ninety-nine percent of the time when there was no fighting, read the memoirs of such men, who had opportunity to enjoy the best of times, partook in many of the greatest adventures and thankfully had the spare time to record them for posterity. I have no doubt that the memoirs of John Harley will join these hallowed ranks once they are republished and gain a wider audience. John Harley was a rumour monger, he loved scandal and enjoyed recounting it at great length; whilst his own life was hardly run of the mill itself. Although he did not write his memoirs until the 1830’s, Harley remembers a great deal; names, personalities, incidents and tragedies and although his memory might occasionally forget the correct ranks or some of the finer details; every one of the major incidents he records is to be found in the records. This memoir has however been a real challenge, almost certainly the hardest I have ever had to deal with. This is because, when published, as often done in Victorian books, many names are obscured with only the first letter shown to avoid both embarrassment to the living and also probably to avoid serious libel action. This however, makes it very difficult to be certain with identifications when working back and it requires a great deal of checking and re-checking to be certain. I am very pleased that in the end, well over 97% of these individuals have now been identified with high levels of certainty and in these situations I have completed the full name in the text indicating by [-] the letters I have re-inserted. However, a very few have proven particularly stubborn or impossible to identify with any certainty at all, often where unfortunately Harley does not give enough information to be exact. The other issue is that he sometimes rambles off with a good story and breaks his sequential narrative, this also makes it difficult sometimes to identify when an incident happened – I have therefore added the odd short passage to help the reader keep to the path when necessary. As with any such material, there does need to be some note of caution used. In some of these cases John Harley was involved personally and he clearly had a vested interest in portraying events in a light favourable to himself. In these, and only these few cases, he may well be guilty of distorting the truth and hiding his shadier side. This is particularly true of an incident that occurred in 1814 toward the end of the war. Paymasters handled a great deal of public money, but they also had plenty of opportunities to act as unofficial loan agents – indeed they were sometimes not far off loan-sharks. They were often the only source of ready cash for officers in the regiments, when on foreign duty far from home and these loans were often left outstanding for many years, indeed decades in some cases with usurious levels of interest incurred. I have recently been able to view the records of another Paymaster, William Deane of the 18th Hussars, his records show that twenty and thirty years after he made loans to officers, some still remained unpaid. Paymasters were officer’s best friends when they needed funds, but their worst enemy much of the rest of the time and that must be borne in mind regarding the complicated case I will try to untangle. It does however include claims of false accounting, dodgy dealing and bankruptcies. But the greatest joy of these pages are the various scurrilous incidents mentioned in these memoirs, which have all been found to be fully established in fact. Duels, bigamy, abductions, women tricked into marriage, sinking boats, cowardice, larceny, murder, corruption, human tragedy, bankruptcy, forgery, suicides, privateers, debtors prison, card sharks, highwaymen, prisoners of war and Garryowen Boys, indeed the whole gambit. It truly exposes the seedy underside of Georgian life both within the army and in civilian life too. John Harley’s memoirs are a total joy and a real eye-opener on many levels – once you have read them, you will never look at Wellington’s army in the same light ever again.